Two leading critics of imperialism – John Smith and David Harvey – have recently fought bitterly on roape.net on over how to interpret geographically-shifting processes of super-exploitation. The risk is that they obscure crucial features of their joint wrath: the unjust accumulation processes and geopolitics that enrich the wealthy and despoil the world environment. Another leading Marxist, Claudio Katz, has recently reminded us of one such feature that deserves far more attention: Rau Mauro Marini’s 1960s-70s theory of subimperialism, which fuses imperial and semi-peripheral agendas of power and accumulation with internal processes of super-exploitation. the imperialist division of the world into oppressed and oppressor nations has shaped the global working class, central to which is the violent suppression of international labour mobility. Just as the infamous pass-laws epitomised apartheid in South Africa, so do immigration controls form the lynch-pin of an apartheid-like global economic system that systematically denies citizenship and basic human rights to the workers of the South and which, as in apartheid-era South Africa, is a necessary condition for their super-exploitation. This is a start, but a rounded Marxist-feminist-ecological-race-conscious critique of imperialism needs a stronger foundation. Smith’s problems begin with the South Africa metaphor and extend to the unconvincing binary of oppressed and oppressor nations, whose main shortcoming is that it underplays national ruling classes aspiring to shift from the former to the latter. The analysis also fails to incorporate aspects of ‘deglobalisation’ that are increasingly apparent in this conjuncture (even before the Trump trade war fully breaks out and current financial market mini-crashes lead to another generalised meltdown). Neglect of multilateral power relations and geopolitical bloc formation also characterises the partly-sterile, partly-inspiring debate that Smith strikes up with Harvey in his 2016 book Imperialism in the Twenty-First Century, in Monthly Review Online in 2017 and now on roape.net, the Review of African Political Economy’s website in January-March 2018. The opening up of global markets in both commodities and capital created openings for other states to insert themselves into the global economy, first as absorbers but then as producers of surplus capitals. They then became competitors on the world stage. What might be called ‘subimperialisms’ arose … Each developing centre of capital accumulation sought out systematic spatio-temporal fixes for its own surplus capital by defining territorial spheres of influence. This is the most vital component: the displacement of over-accumulated capital into geographically-dispersed sites, especially the BRICS, and the re-deployment of this capital into even more super-exploitative sites of surplus extraction, as Marini had projected, including the extractive industries of Africa – although not without debilitating contradictions that must be raised forthrightly. Hence a slightly renovated system for global management of these contradictions has also emerged, even if downplayed by Smith and Harvey in this recent debate. 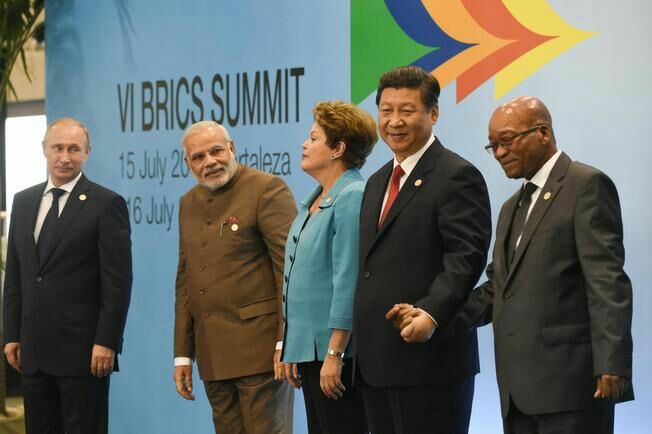 In short, the power structures of global neoliberalism seamlessly drew in the BRICS over the past decade, especially in relation to world finance (during the 2010-15 International Monetary Fund reform era), trade (at the World Trade Organisation in 2015) and climate policies (at the United Nations from 2009-15). The multilateral ‘reforms’ promoted by subimperial powers extend their own corporations’ accumulation and displace their own class, social and ecological backlashes – again albeit with profound contradictions. And there are few places where these kinds of processes are more obvious than here in South Africa.